​There are many small, “social” trails” in the Black Forest. We are in the process of mapping them and will post them here when available. 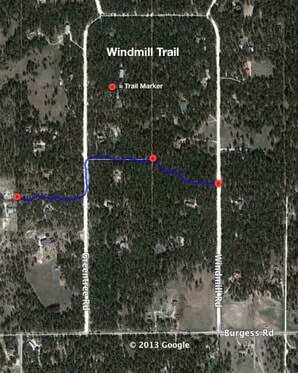 The Windmill Trail is a 1/2 mile trail that connects Windmill Rd with the Chipmunk Trail(see above). The trail is marked with BFTA signs, but be careful when you get to Greentree Rd. Depending on the direction you’re travelling on the Windmill Trail, you need to go 350 feet on Greentree Rd to get to the other side. There are BFTA trail signs marking both ends of the trail, but you may have to look carefully to find the Windmill sign. Click the image to the left to see a larger map. 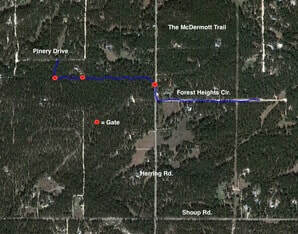 The McDermott Trail is a .9 mile trail that connects Pinery Dr on the west / northwest with Forest Heights Circle. There are 3 gates that you’ll need to pass through. Click the image on the left to see a larger map.